It’s our pleasure to present the new, unique Muki Wiland pen – a limited series of 21.
and to off-set this uncommon material, we decided not to use typical screw threads. Instead, we used cork to link the various elements of the pen in the same way cork is used in the construction of bassoons, oboes and clarinets. Each stage of the work on these models required time, precision and experience. The steps included shaping the isostatic ceramic dust, rolling, multiple firings at temperatures as high as 1700 degrees Celsius (3090 °F), re-polishing, and glazing. The uncommon material allowed us to achieve the exceptional, light color of the pen and its unique structure. All of the elements of the model’s packaging are black – in contrast to the pen itself – yet each of them has a different texture. Muki Wiland comes in a hand-made, lacquered box, which shimmers through the azure external case. and the above-mentioned stand, which we designed specifically for this model. 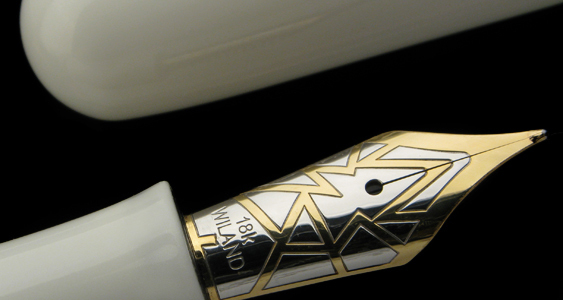 We have equipped the pen with an 18 carat gold nib, with a two-colored rhodium-plated drawing, and decorated with an abstract graphic rendering of the letters W I L A N D. The letters form an open composition which gives the impression of stretched architectural construction. This pen, similarly to the Aleksandra model, is dedicated to a woman who lived at the beginning of the 20th century, Miss Muki.